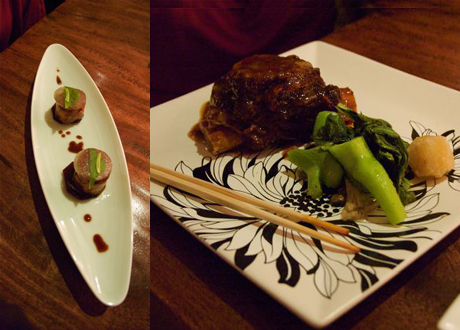 I was a bit dubious when “Rime”, a Turkish restaurant on Commercial Drive, re-opened as a Japanese joint called, Lime. But it looked intriguing and I love Japanese food, so eventually got to check it out and it’s pretty much my new favorite place on the Drive now. The menu covers everything from Japanese inspired burgers with rice cracker buns and wasabi mayo to sashimi. The toro stack – tuna belly, quail egg and nori – was a decadent start, but couldn’t compete with the butter-soft monkfish liver (out of season now). For the main course I had the beef short rib with gai lan and sampled some of my partner’s chicken yakitori – marinated in miso and served with fried rice and quail egg. Both were hearty and filling with complimentary, fresh flavours. It’s a dark space, separated into several different levels, which creates a feeling of intimacy, although we were there when there wasn’t anyone on stage. They have live music on almost every night from 7 PM onwards, so that’s something to think about if you’re planning on chatting between chopstick bites. Lime is at 1130 Commercial Drive. I’ve certainly wanted to go again! What is the season for Japanese limes and are they available in Los Angeles? Hi Teri, the Lime in question here is a restaurant in Vancouver. I’m not sure I can give you much information about Japanese limes as a product.